Are Your Dental Habits on the “Worst” List? Home | General Dentistry | Are Your Dental Habits on the “Worst” List? Be honest—on those nights when you can’t keep your eyes open and all you want to do is crawl into bed, what part of your bedtime routine is first to go? For most people, it’s brushing their teeth. Even as family dentists, Dr. William Wager and Dr. Brian Evans know that everyone can get a little lazy about their oral hygiene from time to time, but it’s our goal at Wager Evans Dental to educate our patients about healthy dental hygiene habits. Read on to find out more about why those occasional slip-ups may be more detrimental to your dental health than you thought. Brushing only your teeth instead of brushing your entire mouth is a bad hygiene habit. Your teeth only account for about 5 percent of the surface area of your entire oral cavity, so it’s important to brush the front and back surfaces of your teeth, as well as your tongue, the insides of your cheeks, the roof of your mouth, the floor of your mouth, and your lips to maintain a clean—and hopefully plaque free—environment. 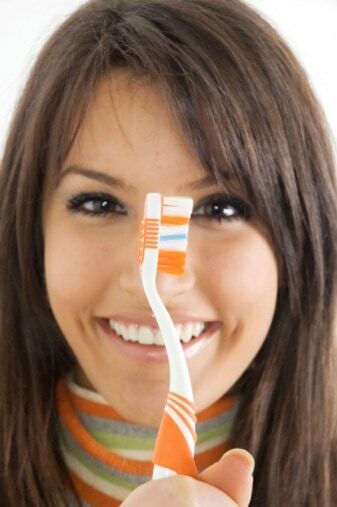 Brushing too hard is a mistake made by many because they think that brushing harder makes for cleaner teeth. This isn’t true. In fact, brushing too had can have the opposite effect because it can cause trauma to the teeth, such as gum damage and enamel erosion, which can lead to tooth sensitivity and discoloration. Brushing only twice a day is another common dental hygiene mistake. Yes, it’s important to brush in the morning and before bed, but it’s also beneficial to brush throughout the day to reduce the presence of harmful bacteria in your mouth. Skipping flossing is one of the worst things you can do for your oral health, but, unfortunately, it’s probably the most common dental mistake. Your toothbrush can only clean the surfaces of your teeth, so harmful plaque and bacteria lurk in the hard-to-reach crevices in your smile and can lead to serious oral health problems, including tooth decay and gum disease. It’s best to floss throughout the day, but if you can only manage to do it once, make sure you floss before bed. Rinsing with mouthwash only isn’t a suitable alternative to brushing and flossing. The rinse will help kill germs and freshen your breath, but the bacteria and plaque will not be removed from your teeth. As you can see, we only discussed 5 of the 10 worst dental hygiene habits. Stay tuned for the rest! In the meantime, think about your own dental hygiene routine and take these tips into account. For more information about dental hygiene, or to reserve an appointment at our Reno dentist office, call Wager Evans Dental, serving the communities of Sparks, Sun Valley, Cold Springs, Spanish Springs, and Golden Valley, at (775) 829-770.